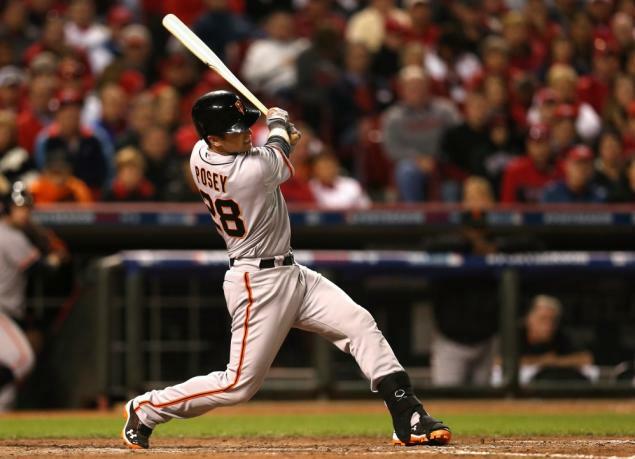 Buster Posey won the National League MVP award the other day. It was his first one. He could have more. This was his first full season in the Majors. He came up in late May back in 2010, and we all know what happened last year. Of course two years ago he also won the ROY. It seems that whoever Buster gets judged against, he stands above. We may be seeing a legend in the making here. He is a big part of the reason there is hope for a sustained run of success. Who knows, we may be entering a time of dominance for the Giants not seen since the Yankees of old. It seems possible, and Buster Posey would be right in the center of it. When you look back on those dominant Yankee teams of the 50's under Casey Stengel, the player that comes to mind is not Mickey Mantle, it's Yogi Berra. The real anchor of that team. Now I know I wasn't alive back then to watch Yogi play, but I have been reading about it my whole life. The most influential baseball era in my life before the current Giants, was the late 40's thru the late 50's. That's what shaped my baseball fandom because it's what my Dad grew up on. And seeing as how Mom was a teacher and had me reading at an early age, what else would I read about? I have read so much about that time in Baseball that I feel like I have lived it. I digress, the point is Yogi and Buster. Casey Stengel used to say that when Yogi was in the lineup that he was never worried because he had who he liked to call "My Man". Essentially Stengel felt like he turned the keys over to Yogi to lead on the field. Bruce Bochy has done the same with Buster. He said as much during the various press conferences during the playoffs. Buster is in the driver's seat for the team. Not many players can be singled out as leaders so easily, but this is what makes them great. Neither Buster nor Yogi were full time catchers growing up. Berra had to basically learn the craft at the Major League level his first few years. Buster was a SS and pitcher, catching came to him in college. It's as if they were identified as the type of guy you just want to build around. Now I know Yogi is a character, but that's not on the field. When he stepped out to play a game, all that mattered was winning. Posey is from that same mold. Buster is on track to have a Hall of Fame resume. If you add in the fact that his team may also win multiple championships, he'd be in an elite class. Yogi seems to be this class. Their beginnings are very similar, and barring injures Buster could win a few more MVP's and WS trophies. Yogi had 3 MVP's and won 10 championships. In this day and age it's tough to think Buster can get to 10, but putting up 4 or 5 might be very likely. I thought the best way to compare the early years of Yogi and what Buster has done so far was to break it down in to an avg of 162 games. So what the production is over a season. I used Yogi's first 4 years to match up with Posey's first 3 because Berra wasn't really full time until his 3rd year. He also had a different manager for his first 2 years before Stengel took over in 1949. As you can see they are very comparable in production. Buster hits a little better for average and walks more, Yogi strikes out less. Otherwise it's basically a toss up. As the years went by Yogi played catcher less and less. It can only be assumed the same will probably be done with Buster. He already plays 1st at times, but he could be headed for left field someday. 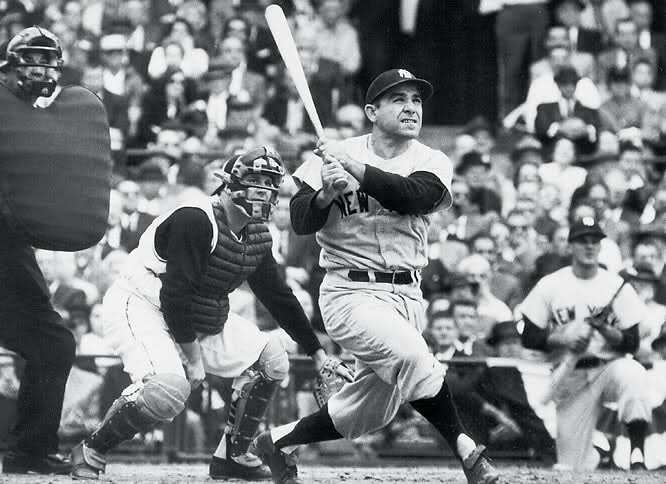 Yogi finished up his years primarily as an outfielder. 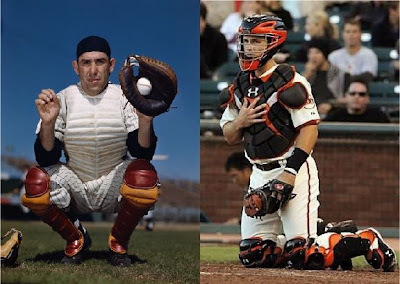 If Buster Posey continues to be Bochy's "Man", he may one day be as decorated as the great Yogi Berra.